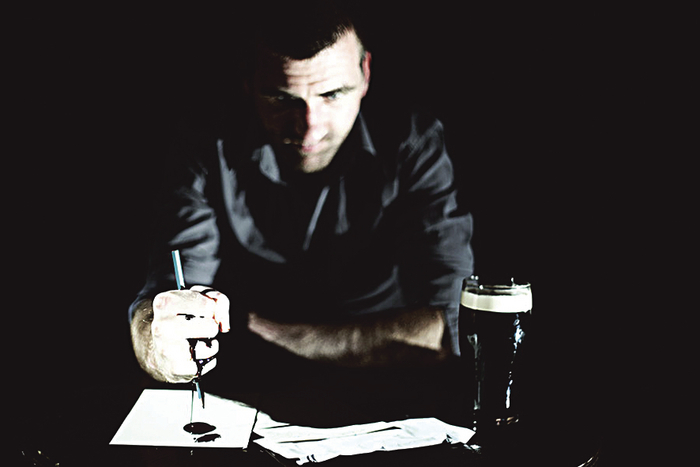 CURRENTLY RUNNING at the Town Hall studio is Cathal Leonard’s debut play Forgotten Me, a two-hander performed by himself and Gerry Howard and directed by Danielle Destephano. Forgotten Me is set in a dingy Cricklewood pub where two unlikely characters, Eddie (Leonard ) and Edward (Howard ), engage in conversation that at first seems comic but soon reveals that there’s more to their past than either of them realise. Edward is the burnt-out emigrant who arrived in London 30 years earlier, while Eddie is a voluble young Dubliner who has just arrived and annoys the older man with his seeming naivety and endless questions. The minimal set – two chairs and two small tables placed side by side - could have done with one or two embellishments to better establish the play’s pub locale but the play’s real strength is in the dialogue between the characters and the solid performances from both actors. Howard is especially good as the older man; initially testy and irritable as the play progresses he reveals the inner wounds and regrets that have long shadowed him and also reveals the warm side of his nature. Leonard’s garrulous Eddie plays well off Howard’s Edward, their contrasting personalities make for a lively pairing. Danielle Destephano’s direction keeps the action moving crisply along for the play’s 45 minute duration and all in all Cathal Leonard can be well satisfied with his authorial debut. Forgotten Me runs at the Town Hall studio until Saturday August 30, at 8.30pm. Tickets are €10.